Eric and Sheena Greitens hold their sons, Joshua and Jacob, while speaking to reporters after casting their ballots the St. Louis Public Library in the Central West End on Tuesday. 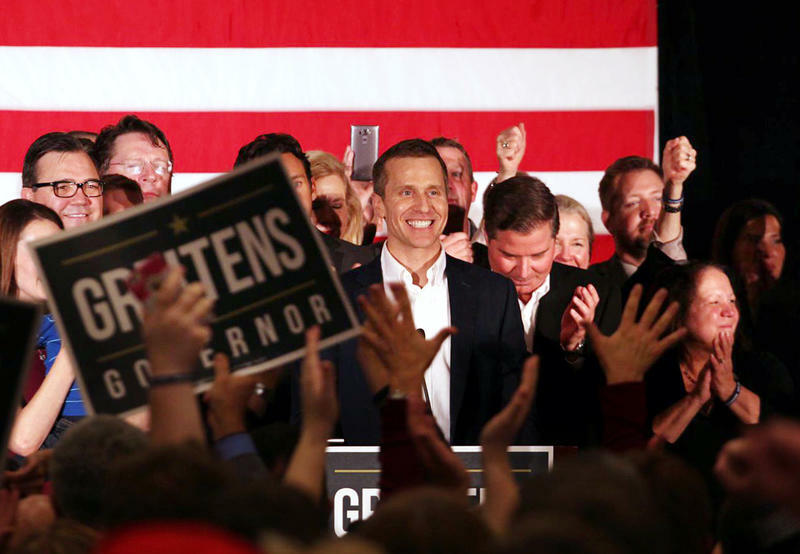 Greitens – who has never held public office — “intends to lean on Gov. Nixon for as much guidance and wisdom as possible over these next two months,” Chambers said. Greitens defeated his Democratic rival, Missouri Attorney General Chris Koster, by about 160,000 votes and carried 111 counties – generally rural Missouri. Although Koster – favored in early polls — had the endorsements of traditional pro-rural groups such as the NRA and Farm Bureau, he carried only the traditional Democratic-leaning territory in Missouri, including the cities of St. Louis and Kansas City, and St. Louis County. Greitens’ victory is part of the GOP sweep of Missouri state government, which was led Tuesday by now-president-elect Donald Trump, who carried the state by almost 20 percentage points. Greitens’ team is already working on planning his inaugural on Jan. 9, and in compiling resumes for the dozens of key governmental jobs he will need to fill swiftly. Chambers said the team will set up two websites: one to lay out the inaugural calendar and the other to handle inquiries from job seekers. The Greitens team is focusing now on key staff positions, Chambers said. That includes Greitens' plan to hire a chief operations officer to handle day-to-day operations. 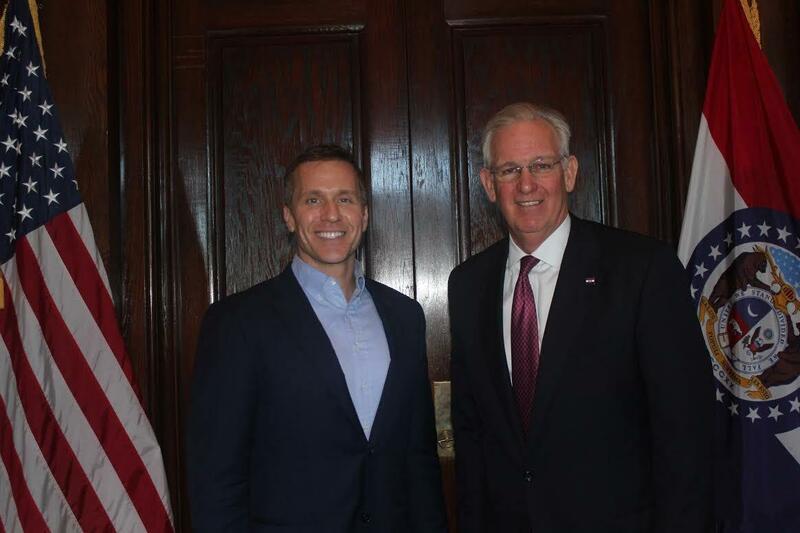 Gov.-elect Eric Greitens and Gov. Jay Nixon talked about transition on Thursday. As soon as he takes over, one of Greitens’ most pressing tasks will be crafting a proposed state budget to be formally presented to the General Assembly soon after. Greitens will put his own stamp on the budget, Chambers said, but necessity will require that he also rely on Nixon’s budget team, which already has been working on it. Negotiators with the General Assembly and the governor’s office usually reach an agreement in December on their estimate of what the state’s income will be for the coming fiscal year. Chambers said Greitens remains committed to that task, but he also wants a successful working relationship with state lawmakers in both parties. “We’ve got to get advice and counsel and guidance from the folks who have been there,” Chambers said. Republican legislative leaders do share his desire to swiftly act on legislation to make Missouri a "right to work" state. Such legislation would curb union rights by barring employers and unions from requiring workers in a bargaining unit to pay dues. Chambers said the legislative meeting also focused on other priorities, but he said it was too early to discuss them. Greitens and his wife, Sheena Greitens, also had dinner Thursday with Nixon and his wife, Georganne Nixon, in the Governor's Mansion. The Nixons gave the incoming occupants a tour of the mansion. Chambers said the Greitens family will move into the mansion, but the timetable has yet to be set. The couple have two young sons. It’s been more than a decade since a family with young children moved into the mansion. Then-Gov. Matt Blunt, R-Mo., and his wife, Melanie, also had young children. But she and the children spent a lot of time at their existing home in Springfield, Missouri. Even with the move, Sheena Greitens plans to retain her post as an assistant professor in political science at the University of Missouri at Columbia, Chambers said. He added that her husband/governor-elect is proud of her career.